Passing through Ayala’s leafy avenue, crossing its lighted underpasses and running through its snaking pedestrian skyways, I rushed through Makati’s central business district like a daft executive on a tight schedule. I glanced at my watch and it’s already ten past lunchtime, I’m late! I crossed over to the cool interiors of Greenbelt 5 and at last found my rendezvous, I’m gonna have lunch at the newest food sensation hitting the yuppies and business executives of the Ayala district, Chops Chicago Steakhouse. Located on the uppermost level of the mall, the steakhouse has been making silent waves since it opened last June. It caters mostly to businessmen in the area looking for a quiet place to dine while discussing business matters. Wi-fi enabled bistros are the norm now but where else can you find a restaurant that has its own fax machines, photocopiers and scanners? Slick eh? 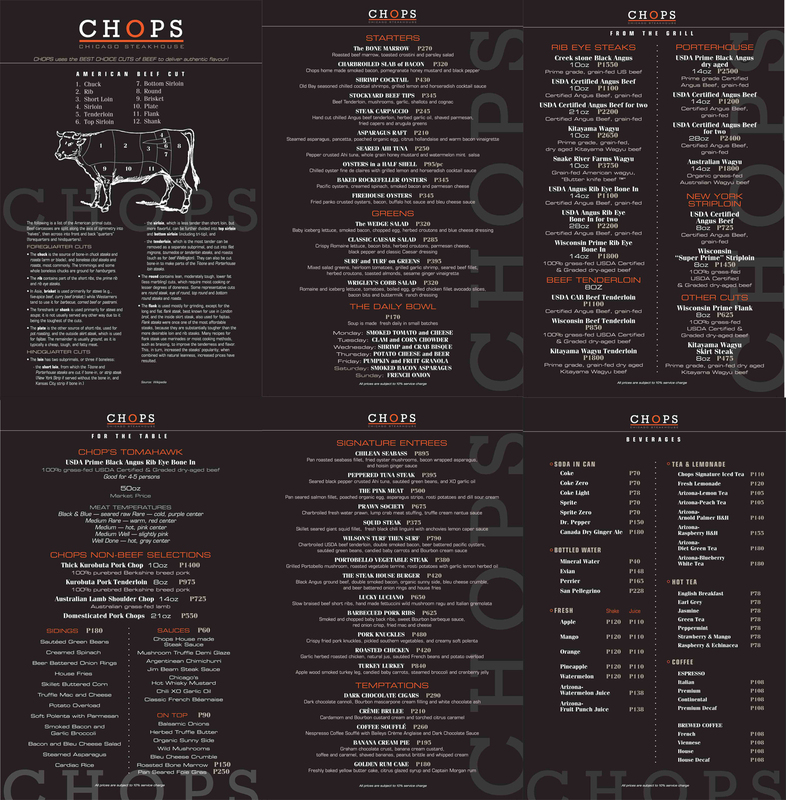 Chops Chicago Steakhouse’s interiors exude a dark cozy atmosphere reminiscent of gangland Chicago during the 1800’s. It’s almost like a personal den where you can just sit back and relax—and have your steak too. The walls are finished with combinations of red bricks, wood panels and white clapboard sidings. Huge lamps illuminate the booths, giving a retro feel to the joint. The restaurant lives up to its Chicago moniker with its Frank Lloyd Wright art pieces lining its walls. Our agenda for the day is to check out Chop’s Executive Lunch. It includes the Soup of the Day or Classic Caesar Salad for starters, Wisconsin Beef Tenderloin with Siding and Sauce and Dark Chocolate Cigars for dessert. Everything is set at Php888.00, quite a budget for backpacker types like me, but surely loose change for the tycoons frequenting the area. The first on the table were Chops’ complimentary Homemade Whole Wheat Rolls, which unfortunately I wasn’t able to try since I was late for the meeting and was busy taking photographs of the restaurant’s interior. Next up were the starters, Chops’ soup of the day, Cream of Asparagus (Php170.00 ala carte). It was okay, basic stuff and nothing too fancy. It was a good prep perhaps for the incoming onslaught of steaks coming our way. Although the original Executive lunch only offers either one of the two starters, they were kind enough to let us try their Classic Caesar Salad (Php285.00 ala carte) too. I like it better than the soup especially with a sprinkling of pepper. I was constantly nibbling at the lettuces until our main course arrived. A few minutes later and wooden chopping boards were laid on our table topped with a juicy bulging portions of Wisconsin Beef Tenderloin Steak (Php850.00 ala carte). A dash of greens and a cup of gravy completed our plate. It’s my first time to eat on a chopping board and the staff assured us that these are oven heated for sterilization and absolutely free of any contaminants. I usually have my steak well done but this time I tried it medium. And I absolutely love it. The steak is super tender without being a bloody mess. It was flavorful enough without the gravy, but I cannot live without gravies and so pour I did. A menagerie of sidings arrived along with the main course. Our group was served with all the available side dishes so we can try everything out. To say that it was overwhelming is an understatement. Surprisingly, my favorite among the bunch is their House Fries. I love its rough texture, its crispness and its slightly salty flavor. It was way better than any other fries I’ve ever had. Before bringing out the desserts, we also tried out a few of their entrees. The Bone Marrow (Php270.00) is basically a roasted beef marrow with toasted crostini and parsley salad. This is absolutely sinful, I only tried a small portion and immediately felt my head spinning. The Barbeque Pork Ribs (Php625.00) was an absolute stunner. I forgot about the fries and onion ring on its sides and dug in. The meat was so tender it easily fell off the bone with little effort. Flavorwise, I find it to be a tad too sweet for my taste though. Being a fan of crispy bacons, I actually didn’t like the Smoked Bacon and Garlic Broccoli sidings (Php180.00) that much. But when the Charbroiled Slab of Bacon (Php320.00) was plunked down our table, I couldn’t help but take a few cuts for myself. This version of their homemade smoked bacon was absolute heaven and can even compete with their steaks. And last but not least, our desserts arrived. Chops Chicago Steakhouse aptly finished the affair with chocolate sweets fashioned after cigars (Php290.00). Like gangsters after a full and satisfying meal, we smoked our tobacco, feeling like the Don’s of Chicago’s bygone eras. Chops Chicago Steakhouse definitely captured the soul of mobster-era Chicago. From the interiors to the food, everything is done in a very masculine manner. But unlike Chicago’s gangland of the 1800’s, the hat-wearing mobsters meeting in their dimly lit dens forking their Italian dishes are now replaced with crisply-suited executives doing business while digging through their steaks. it looks like a cool restaurant in a busy metropolitan area, where business people, artist, fashion designers, writers, bloggers, and mobsters can hang out to discuss business as they eat lunch or dinner. i thought all the vegetarian dishes here looked good.